Early Bird Online Registration Extended! Register now for winter and spring 2014 fun, like Cinematography, Guitar and Boot Camp AND save on registration! 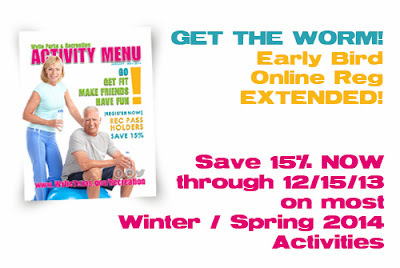 Save 15% now through Sunday, 12/15/13 on Winter / Spring 2014 Wylie Recreation Activities during Early Bird Online Registration.